Autochartist provides brokers with unique content for social media and marketing initiatives. This means that we provide a cost-effective means of producing unique, multi-language content, at a fraction of the price you’re currently spending on such initiatives. We use your data for our analysis. Step 2: We send the content to your social media channels and website, and link the two together. Step 3: You promote the posts you like best to get click-throughs to your website. Below table compares human-written content to Autochartist-written content. Despite the obvious operational efficiencies gained through using Autochartist's content, human-written content is very valuable to "spice" up social media channels. Whether your ROI from Social Media platforms is questionable, or you’re actively promoting social media interaction with your customers, we have the ability to reduce the amount of effort and money you spend keeping your channel active and engaging. 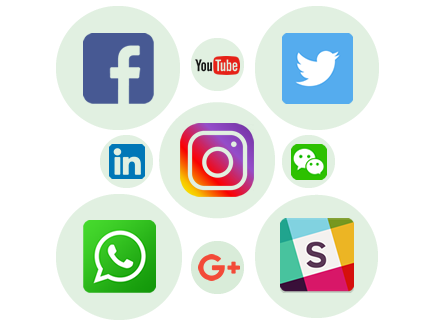 We can automatically post to dozens of social media platforms, including the most popular ones such as Facebook and Twitter.